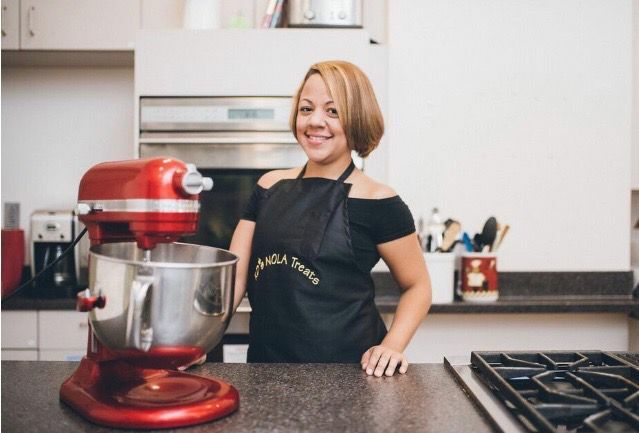 Kim DeJan started her KD’s NOLA Treats dessert caterer from her home in New Orleans East and is developing the brand at events around the city. The food court Roux Carre was designed to help develop new culinary businesses from women and minorities in New Orleans. The nonprofit Good Work Network developed the new food court Roux Carre in Central City. Johnny’s Jamaican Grill is a vendor at Roux Carre, an outdoor food court in Central City. Oowee bars are a popular pick from KD’s NOLA Treats, a dessert caterer in New Orleans. Get email notifications on Ian McNulty daily! Whenever Ian McNulty posts new content, you’ll get an email delivered to your inbox with a link. Kim DeJan has built her KD’s NOLA Treats with small, bite-sized desserts, but she has big ambitions for her homegrown brand. This week she takes another step toward them. KD’s NOLA Treats is the first vendor for a new series of pop-ups at Roux Carre, a unique business development food court in Central City intended to level the playing field for women and minority entrepreneurs. For a 12-day stretch running through Jan. 28, DeJan will have a walk-up stand here to sell her praline brownies and red velvet cake shooters, her mini Key lime pies and ever-popular oowee bars. Stay in the know about New Orleans’ biggest food and music headlines. Sign up today for our newsletter! It’s part of a revamp for Roux Carre itself, which by March should have a new slate of food vendors selected through its pop-up series. DeJan started KD’s NOLA Treats by selling desserts from her home in New Orleans East. She hopes to eventually develop her own production facility with a storefront and a teaching kitchen, where she can expand the baking classes she now holds for children in Broadmoor’s Rosa Keller Library. To get there, she’s sold her treats door to door, catered parties and fielded festivals and events. The Roux Carre pop-up is a new tactic. Roux Carre was designed to fill that role, though its approach has been evolving. The food court was created in 2015 by the business development nonprofit Good Work Network. Its overarching goal is to make the economy of New Orleans more inclusive for women and minorities, and the food court gives that mission a culinary lens. The food court was conceived as a lower-risk avenue for emerging talent and new entrepreneurs to field-test their concepts without the cost of a conventional restaurant. It provides walk-up stands in its open-air food court and training and coaching behind the scenes. A number of food concepts have cycled through Roux Carre’s five stands in the past two years. There is currently only one full-time vendor here. That’s Johnny’s Jamaican Grill, a business that Clinton Haughton started with a kettle grill on the sidewalk before moving up to a food truck. At his Roux Carre stand, he serves spicy flavors from his native Jamaica. Roux Carre also has a bar for juices, beer and wine, which is run by the food court itself. The new pop-up series is an extension of Launch Pod, a four-month business accelerator program that Good Work Network introduced late last year. The nonprofit also runs a related series of culinary business development workshops called Mise en Place, which is ongoing and open to the public. Entrepreneurs participating in Launch Pod will alternately run pop-ups to test their concept with paying customers. There will be a new concept popping up here every other Tuesday, continuing through March 4. Then, on March 11, Roux Carre will host a collaborative pop-up dinner with all those who took part. At that event, the group will announce the list of concepts that will be offered residencies to operate in the Roux Carre longer term. They’ll be offered individual spaces in the food court for up to three years, with the intent that they will outgrow or evolve past the Roux Carre program by then. In addition to DeJan’s KD’s NOLA Treats, Roux Carre will have pop-ups from Melissa Araujo and Pepper Bowen of Alma, Aaron Washington of Local Menu NOLA and Lisa Nelson of Queen Trini Lisa.